The company building a new police station in Lawrence has an employee who serves on the city's Board of Public Works. Is there a conflict of interest? LAWRENCE — A City of Lawrence board member voted in favor of a project change order requested by his own construction company, raising ethical concerns and questions about a potential conflict of interest. 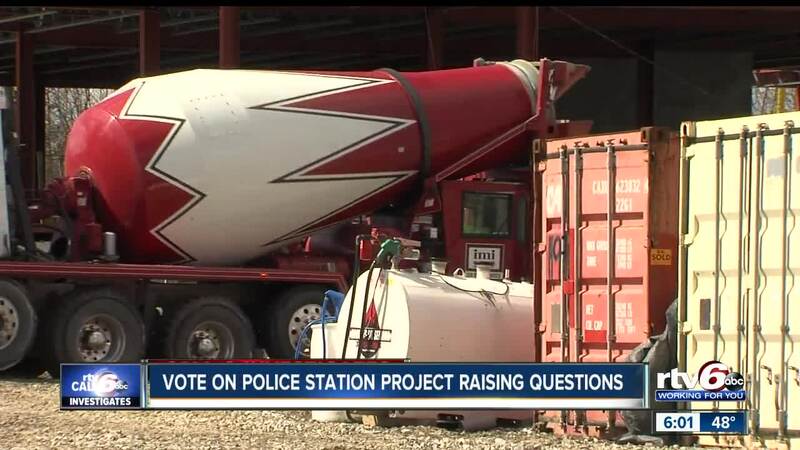 Garmong Construction Services is the company building the new Lawrence Police Station at 5150 N. Post Road, which broke ground in July 2018. At the Board of Public Works & Safety meeting on February 28, Garmong’s Vice President of Business Development Paul Okeson requested a $725,410 change order on the police station project. David Freeman has worked for Garmong Construction Services since August 2016, and currently serves as a construction superintendent. Freeman voted “yes” to the change order, and the request passed with a 2-1 vote. Board member Tracy Ashcraft voted no, after requesting the board continue the matter so it could further investigate, but her motion failed to get a second. “I feel like it’s my responsibility to watch the money and watch the dollars,” said Ashcraft. Ashcraft did not expect Freeman to vote. “You told me you were going to recuse yourself from voting because you work for Garmong,” Ashcraft told Freeman at the February 28 meeting. Freeman abstained from one previous vote involving the police station which approved bid specifications for the project. The vote did not sit well with Lawrence Common Council member Rick Wells. Freeman was appointed by the Mayor Steve Collier. Ashcraft said since the meeting, she’s heard from concerned taxpayers. “I think it really brought a lot of mistrust to the citizens,” said Ashcraft. “I don't think he should have taken that vote. Morally it looks bad, and I don't think it really represents that transparency that we're all trying to shoot for. " Ashcraft said Freeman should have recused himself. Call 6 Investigates spoke with several experts who specialize in local government and conflict of interest. IU Bloomington law professor Paul Helmke said unless the public official’s income or net worth increases as a result of the vote, Indiana law doesn’t consider it a conflict of interest. Mayor Steve Collier said he told Freeman it was OK for him to vote on Garmong’s change order. Professor Helmke also said another reason it’s not likely a violation is because the mayor appointed Freeman, and the mayor approved the vote. However, Helmke said just because the vote was allowed under Indiana law doesn’t mean it was the right thing to do. Freeman declined to speak with Call 6 Investigates on camera but provided a statement. Freeman abstained from at least one previous vote involving the police station, which was an approval of bid specifications. “At that time I did not know if my company would have me working on this job,” said Freeman in an email to RTV6. Days after the February 28 vote, Freeman sent an email on March 4 to the mayor resigning from the Board of Public Works & Safety. Meanwhile, board member Tracy Ashcraft says the City of Lawrence needs to adopt stricter rules for how public officials can vote on projects. Cynthia Baker, a professor at IU McKinney School of Law, said local governments can adopt stricter ethic ordinances addressing political activities, gifts, conflicts of interest, and nepotism. “Doing so speaks volumes regarding the education and expectation of those who serve as public elected officials, the public integrity of local government, and promoting a sounder, more ethical public culture,” said Baker in an email to RTV6. As for the City of Lawrence, Tracy Ashcraft plans to ask more questions about the issue at the next Board of Public Works & Safety at its next meeting on March 28.